There’s a reason why Sri Lankan Fish Patties (Fish Empanadas) are legendary. 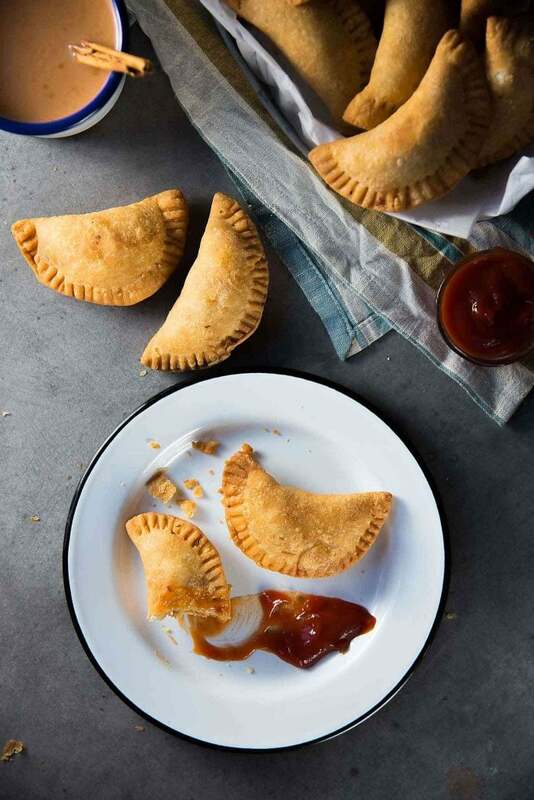 A slightly spicy, savory, scrumptious filling encased in a flaky and buttery crust, these fish pastries are PERFECT for game-day snacking, for breakfast or tea-time snacking, or for entertaining. You can use your choice of protein for the filling or make it vegetarian. They are easy to make and freeze well for later too! 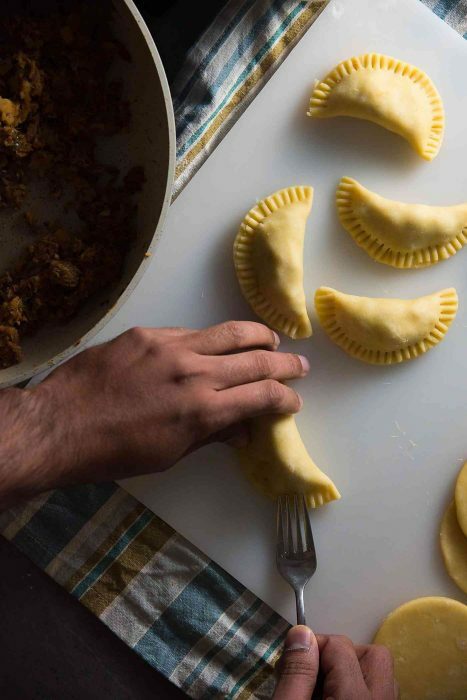 Empanadas are world famous. 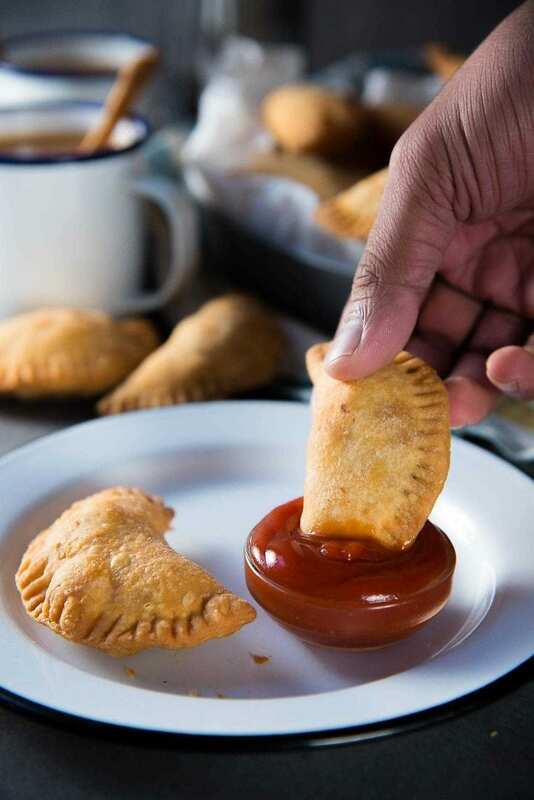 So much so that every continent and food culture has their own version of an empanada. 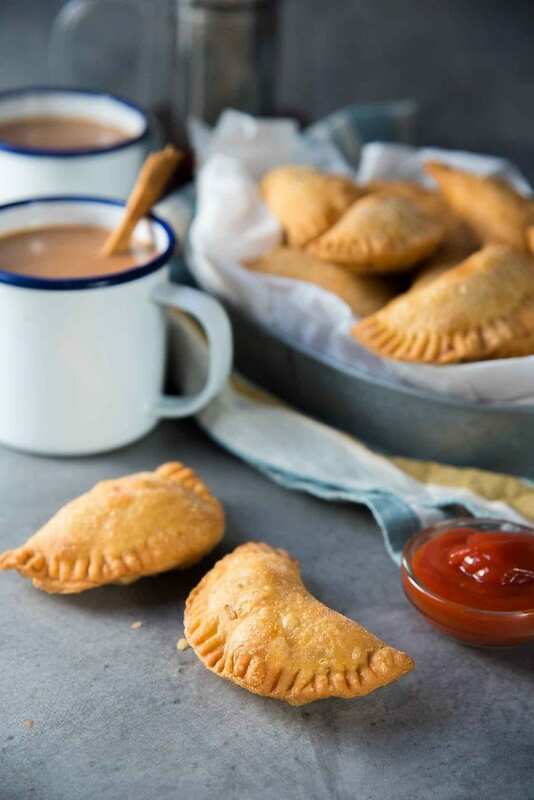 In Sri Lanka, these spicy, savory, scrumptious pastry snacks are called patties (singular: patty), or more commonly fish patties as fish is the most popular filling. It’s a favorite snack in every household in Sri Lanka. You can of course make the filling vegetarian, or use chicken, lamb, beef, fish or any type of protein you like. 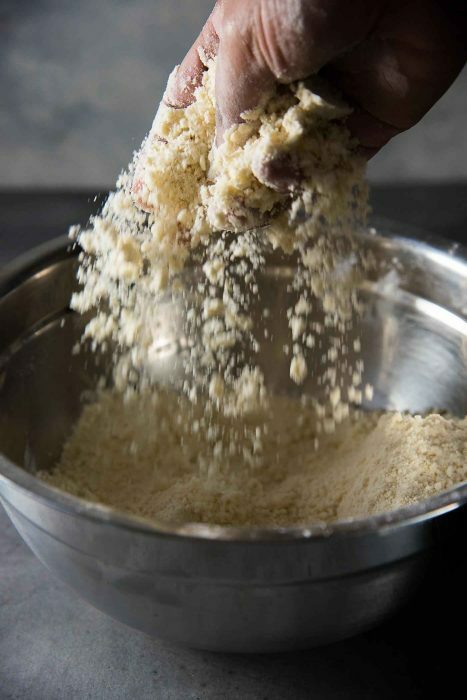 The first step for the dough is to rub the butter into the flour, until it forms coarse crumbs or coarse sand. Sri Lankan patties dough chilled, lightly dusted and ready to be rolled. What are Sri Lankan short eats? Sri Lankan fish patties belong to a very special group of snacks called “short eats”. As the name implies, these are snacks or finger foods that you can nibble on, and are extremely popular as game day food, on road trips, as on-the-go breakfast food, as a tea-time snack, or for parties and entertaining. They are incredibly versatile. In addition to Sri Lankan patties, some other popular short-eats include Chinese rolls (or Sri Lankan Rolls – fried savory crepe rolls that have very little to do with China in spite of the name), cutlets (croquettes), fish buns (maalu paan), yellow lentil fritters (kadala wade), stuffed roti etc. No matter where you travel in Sri Lanka (it’s a tiny island after all), there will be no shortage of street vendors, little cafes, bakeries, and mom and pop joints that sell these fish patties (and other short eats) by the handful. And one of my favorite short eats is these Sri Lankan fish patties (fish empanadas). 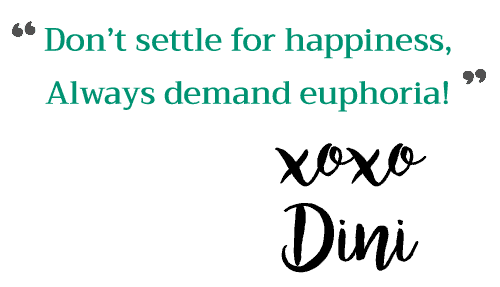 They are slightly spicy, savory, scrumptious, mini-sized comfort food to me. The crust is what makes these Sri Lankan fish patties unique and different from fish empanadas. I’ve been making these fish patties for a while, but the first couple of times were disastrous. They were either too cakey, too crispy, or the taste was off, or the pastries split while frying. But over the years I’ve perfected the dough to make THE MOST DELICIOUS FISH PATTIES ever now! Roll out the dough and cut circles. The dough will be very pliable but not too soft, so you can be generous with the filling. To make sure you add the maximum amount of filling possible, I like to create balls of it and place it in the middle. Apply water along one half of the pastry wrapper edge and fold over the other half to seal the fish patty. Once the edges are sealed with water, use a fork to crimp the edges (ONLY the edges). Be careful not to prick the center. 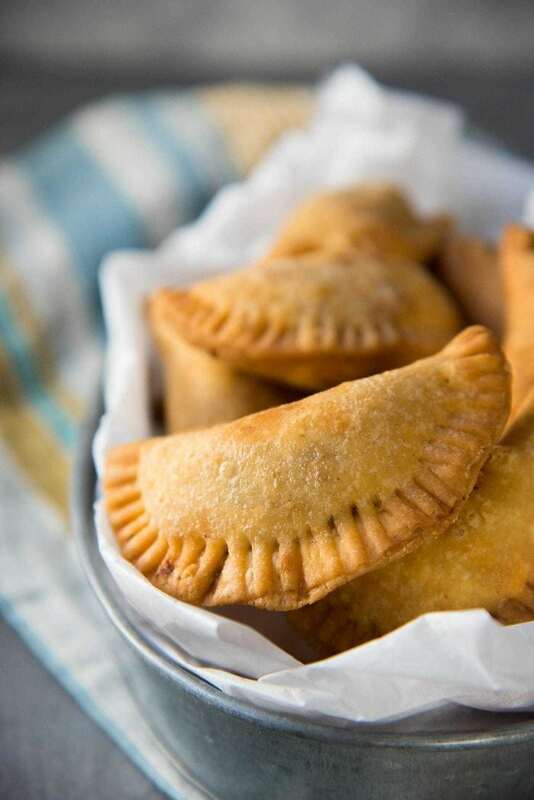 There’s one big difference between these patties and what are commonly called empanadas. 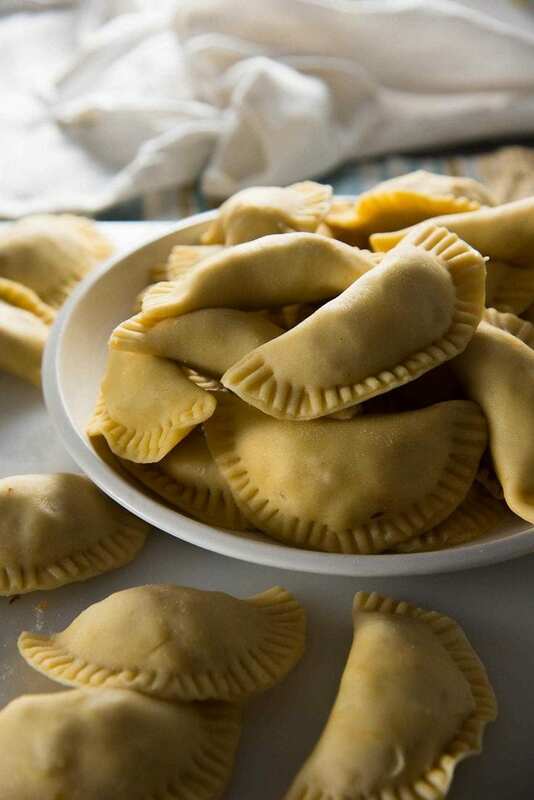 That is the use of butter for patties, while lard is used for empanadas. However, you’re more than welcome to use lard or margarine for patties as well if you like. I’ll go through the recipe step by step to help you perfect your fish patties. They are easy to make, and you can adapt the filling however you like (meat or fish or vegetarian, and more or less spicy etc.). I used canned mackerel for the filling. This is mainly for convenience, but it also tastes great. I always make sure to get canned mackerel in brine, rather than in tomato sauce or oil. I prefer to control the amount of oil or seasoning that I add. If you prefer, you can use fresh fish which will certainly be super delicious. If you are using fresh fish, use a flaky fish like cod, swordfish, or mahi mahi. You can also use tuna. If you have access to only canned fish, look for mackerel, tuna chunks (not flakes), or even canned salmon. Green chili peppers are crucial. Use Thai green chili peppers for extra heat, or serrano pepper or jalapeno pepper for a milder heat. 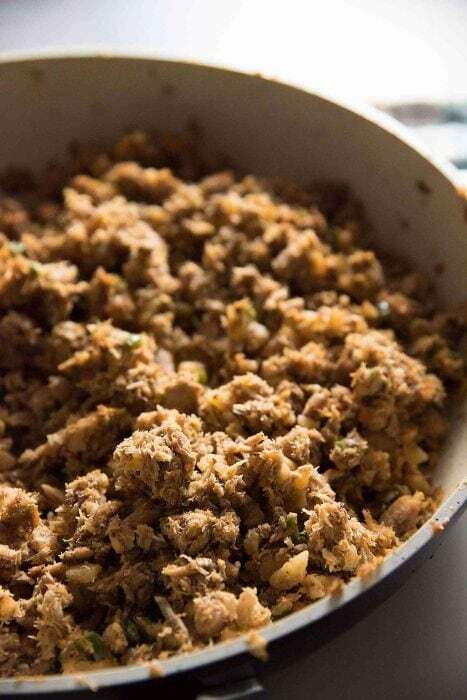 The actual flavor that green chili adds to this filling makes a difference. Lime juice is your friend. The acidity gives a nice balance to the flavors of the fish and spices. So don’t overlook it. This is the same filling that can be used for Chinese rolls (or Sri Lankan fried crepe rolls), and fish buns (maalu paan) and with a little extra potatoes, these are perfect for fish cutlets too. To have that characteristic flaky crust, unsalted butter is rubbed into the flour until it resembles coarse crumbs or wet sand. Unlike shortcrust, you do not want to have pea sized pieces (or chunks) of butter in the dough. If you do not want to use butter (and keep it dairy-free), use margarine instead. An egg yolk is used to bind the dough together, and to make sure the dough is not crumbly. Be precise with water measurements – the amount of water can change depending on many factors. The flour that you use is one factor. Whether you use butter or margarine is another (margarine has more water, so you may then need less water to form the dough). I always start with 1/4 cup, and then add a teaspoon at a time. When the dough has ALMOST reached the right consistency, the BEST way to add more water is to DIP YOUR FINGERS IN COLD WATER, and then knead the dough with your wet hand. This incorporates just enough water for the final knead. If your Sri Lankan patties unseal while being fried (or expand too much and split), that means the dough was too wet or soft to begin with. 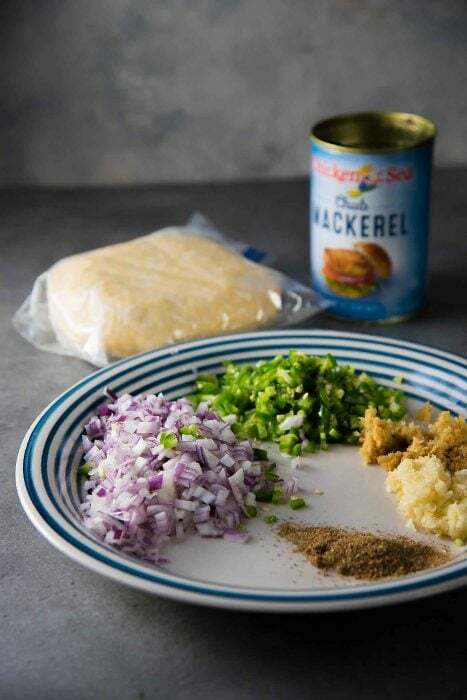 Add 1 tsp of acid in the form of lemon juice, lime juice or vinegar – the acid helps relax the gluten, so you can roll it out better, and the dough will be slightly stretchy, when you get to that point of rolling the dough, and making the patties. Want that characteristic bubbly surface on your fish patties? Add baking powder! It will also make the pastry softer after frying. However, the baking powder is COMPLETELY optional, and you will end up with a slightly crunchier dough. CHILL the dough. The dough rolls out better, and it’s easier to handle when it’s colder. The crust on these babies is perfectly flaky and buttery and taste just so scrumptious. When I was young, I used to eat the filling first and save the crust (the best) for last! I may or may not still do the same thing. 🙂 Every time I make these Sri Lankan patties, I make a double batch because we just can’t get enough of it. So two batches are the minimum, and I freeze one or more batches for later. Line a baking tray with plastic wrap. Place the fish patties on the tray in ONE LAYER, with about 1/2 cm space between each, and at least 1 – 2 inches at the edges. 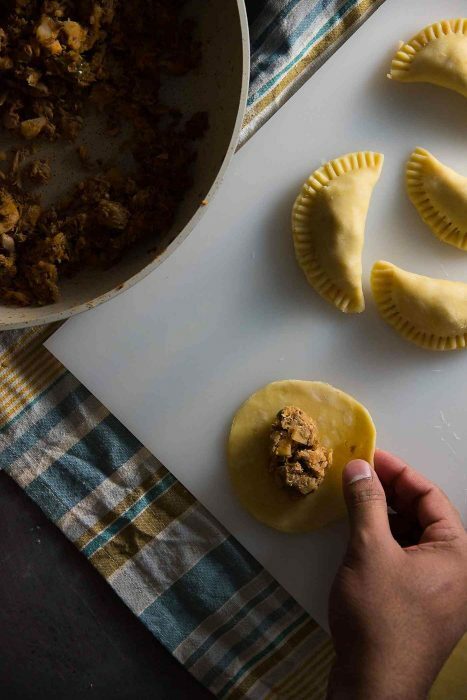 If you need to add a second layer of fish empanadas, place another plastic wrap over the first layer, and place the rest of the empanadas on top of that. Again, make sure to leave 1/2 cm spacing between each one and 1 – 2 inches at the edges. Next, cover with another plastic wrap on top, and fold over the overhanging 1 – 2 inches to create a sealed package. This is to make sure the patties don’t get frost bitten. Place in the freezer for at least 8 hours, until completely frozen. Then wrap the package in foil and keep in the freezer for up to a month. 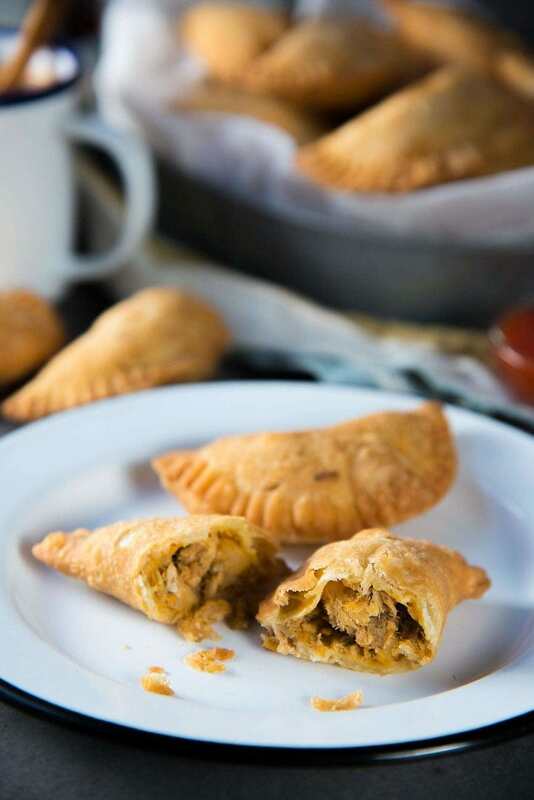 OR place the frozen patties in a freezer-safe container (with an air-tight seal), cover and freeze for up to 1 month. 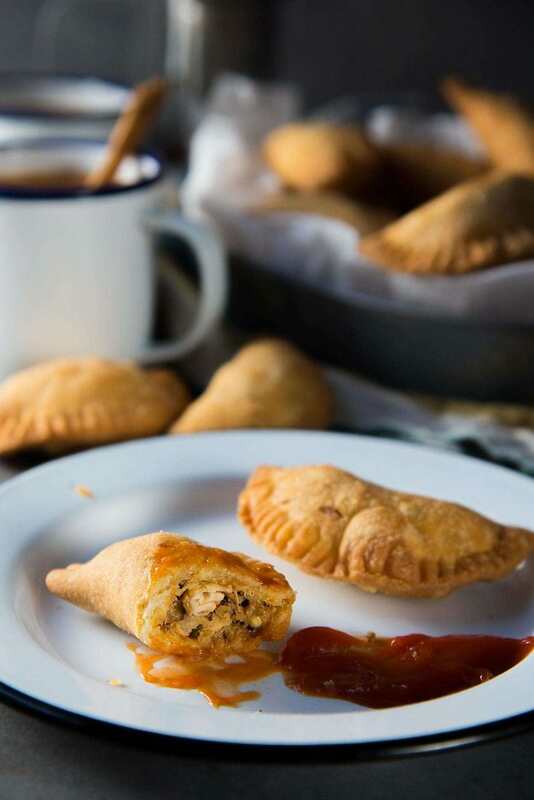 Sri Lankan Fish Patties - a spicy fish empanada with a perfectly flaky buttery crust. Tips & tricks for making PERFECT Sri Lankan patties. Place the flour, salt, baking powder together in a bowl. Whisk to combine well. Add the butter and rub it into the flour using your fingers (or in a food processor), until the flour-butter mix resembles coarse crumbs (or wet coarse sand). Mix ¼ cup of the ice water with the vinegar and egg yolk. Whisk to combine. Make a well in the middle of the flour mix. Add the water-yolk mix and use a fork or your fingers to distribute the liquid through the flour. When the liquid has been distributed, you will have to use your hands to knead the dough to form a dough ball. If the dough is too dry, add iced water 1 tbsp at a time (or less), up to 2 tbsp. The dough should come together to make a pliable dough that's not sticky. If it still seems too dry, dip only your fingers in the ice water and without shaking off any excess water, knead the dough with your wet hands. Form a disc with the pastry dough, wrap it in plastic wrap and refrigerate for at least an hour. If you make the dough the day before and the dough is too chilled, let the dough soften slightly at room temperature. Make sure the canned fish has been drained and the bones removed. If you're using cooked fresh fish, make sure the fish has been de-boned as well. Heat 2 tbsp of vegetable oil or coconut oil in a large non-stick pan over medium high heat. Add the finely chopped onion and saute for a few minutes until they have softened. Add the garlic, ginger and saute for a further 30 seconds until softened. Add the curry powder, cayenne pepper, black pepper. Mix through the onions. 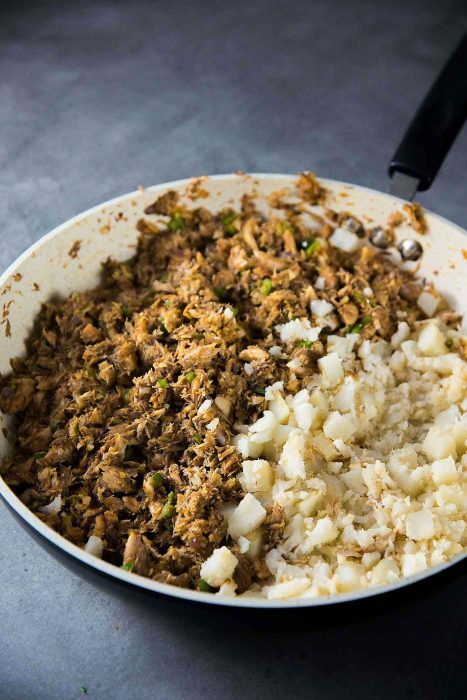 Add the fish and mix it with the onion-spice mix. Break the fish into smaller pieces and saute the mix until it's dry, and takes on the color of the spices, about 10 - 15 minutes. Do not allow the mix to burn (reduce the heat if necessary). Add the tomato ketchup and green chili peppers (serrano peppers) and mix through and cook for a further 5 - 10 minutes. Season with salt if needed (remember you are using brined mackerel, and may not need a lot of salt). Mash the potatoes slightly (with some small whole pieces left intact), and add this to the fish mix. Mix well. Sprinkle the lime juice over the fish and potatoes and mix well. Season and add more lime juice and salt if necessary. 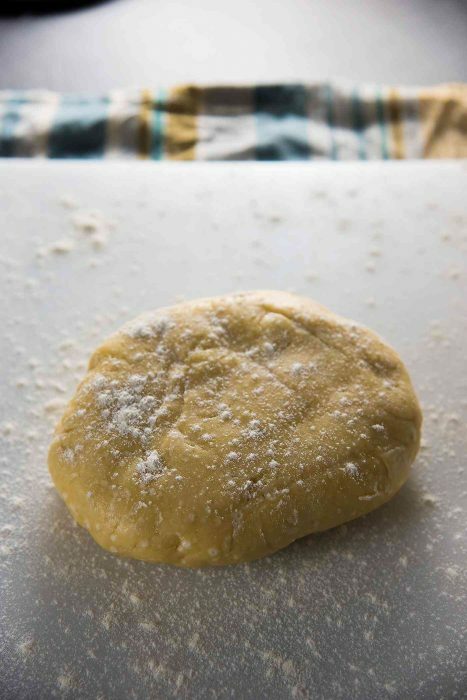 Roll out the cool patties dough on a lightly floured smooth surface. Roll out until the dough is about 3 mm thick. To ensure the dough doesn’t stick to the surface, lightly dust the surface and flip the dough over half way through rolling. This will help prevent shrinking of the dough and it'll roll out better too. Make sure the rolled out dough isn’t sticking to the surface before cutting the patties dough wrappers as well. Cut 3 - 3.5 inch diameter circles using a pastry cutter. Set these aside in one layer and cover with plastic wrap. 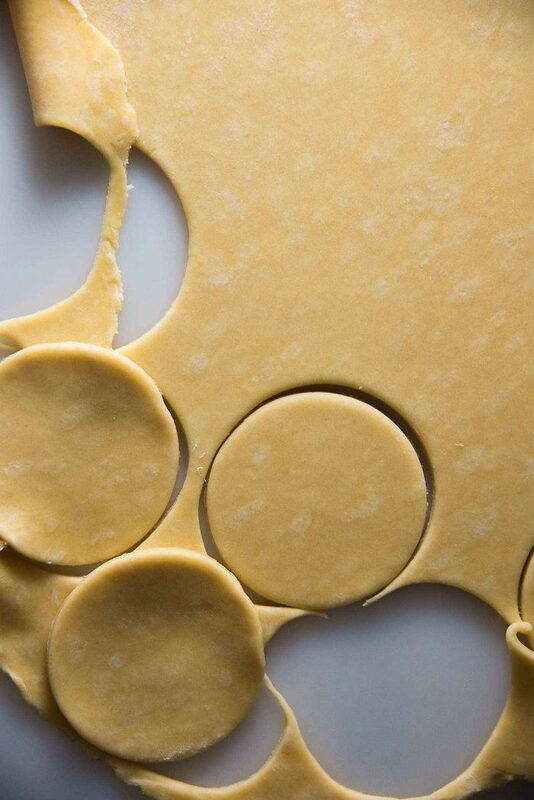 Re-roll the scraps and cut more pastry circles. You should get approximately 15 - 17 wrappers. Take one dough wrapper, and with your fingers, flatten it out slightly at the edges to create a slightly bigger circle (especially if the wrappers shrink a little). Take a spoonful of the fish filling and form a ball that's about 1 ½ inches in diameter. Place this in the middle of the wrapper. Apply water along the edge of one half of the wrapper. Carefully fold over the other half of the wrapper over the filling toward the moistened edge and press down to seal. Use your fingers to form a seal along the edge, and then use a fork to crimp the edges. Transfer the patties to a plate and cover with a plastic wrap. Repeat with the rest of the wrappers. Heat enough oil to deep fry the fish patties (about 3 - 4 inches), or to shallow fry (about 1 ½ - 2 inches). Once the oil is heated to 350°F / 180°C, fry the patties in batches, making sure not to overcrowd the pan. 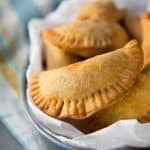 The patties should fry for about 2 minutes until they turn golden brown in the center and slightly darker at the edges (about 1 minute per side if shallow frying). If you are frying the patties from frozen, they need to deep fry for about 3 - 4 minutes until they turn golden brown in the center and slightly darker at the edges. Place the fried patties on paper towels to drain the excess oil. Serve while warm or at room temperature with tomato ketchup or chili sauce. Enjoy! To freeze these fish patties, place unfried fish patties in one layer on a baking tray, and wrap with plastic wrap. Freeze until the patties are completely frozen through. See blog post for detailed freezing instructions. 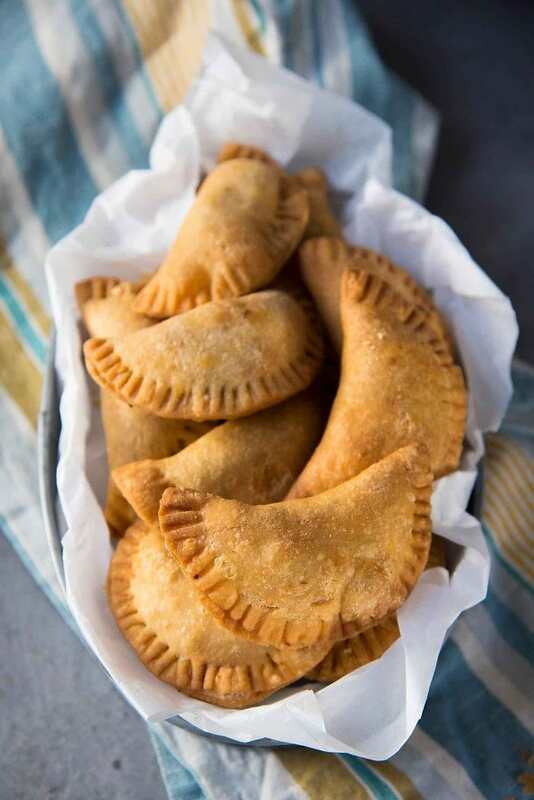 If you liked this Sri Lankan fish patties (Sri Lankan fish empanadas) recipe, don’t forget to subscribe for new (and free) recipes by entering your email address on the side bar (and get all these recipes delivered straight to your inbox), so you don’t miss out on a thing. You can find me on FACEBOOK, TWITTER,INSTAGRAM, PINTEREST, YOU TUBE and GOOGLE-PLUS too. Hi there, have you tried baking instead of frying? I would love to skip the deep frying if possible. I haven’t tried baking these before, so I’m not sure how it will come out. But you could try baking them instead. The texture of the crust will be different though. I’m not certain which temperature to bake these at, but I would bake them between 350°F – 375°F, until the crust turns golden brown. 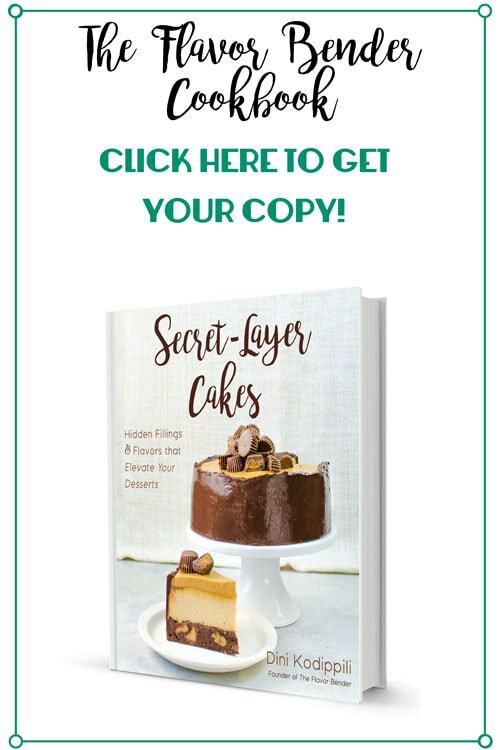 Hello dear, thank you for sharing this recipe. Is it possible to use tuna instead ? You can use Tuna for this recipe too. If you are using canned tuna, I prefer using the canned solid tuna rather than the flaked tuna, as the flaked tuna will crumble too much. If you’re using fresh tuna, you can cook it with a little salt and pepper (until just cooked through), and use that instead as well. As a fellow Sri Lankan, I should say that I am very pleased to see how you are keeping our tradition by adding our favorite short eats on your menu.